I have not posted in a while. I have a lot of excuses for this. I'm about to bore you with them. I was finishing up last semester. Enter braggy brag time. I earned an A in my Organizational Effectiveness class. I earned an A- in my Public Speaking class. That minus is making me very, very mad. I could get all ranty about it. I did get all ranty about it to my family. Very often. They are sick of my ranting. I will not bore you with the ranting that I can do. It is impressive ranting. Have you noticed that I am a perfectionist? I am a perfectionist. Then we did the Christmas thing, which was very nice. I love Christmas. I have been doing projects. I have been taking pictures of projects. The pictures that I have been taking are not very good pictures due to my broken camera situation, which I have ranted about before (see major themes of this blog lately: perfectionistic tendencies, ranting, broken equipment. Funny, I thought I was writing a crafting blog. Whatever happened to that, anyway?) These less than good pictures have made me reluctant to post to the blog, because I want to show off my projects in the best possible way (I'm thinking that if you google perfectionist, I will be among the top hits). 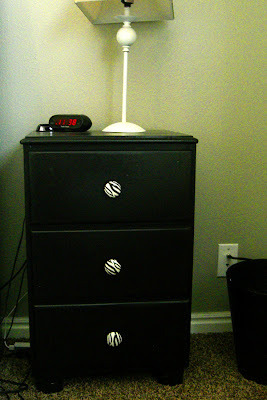 All that to say--Da-da-dah-DAH!--here's my bedside table that I made over a little while ago for the master bedroom makeover. Again with the yuck. This picture does not show the dirtiness of this drawer. 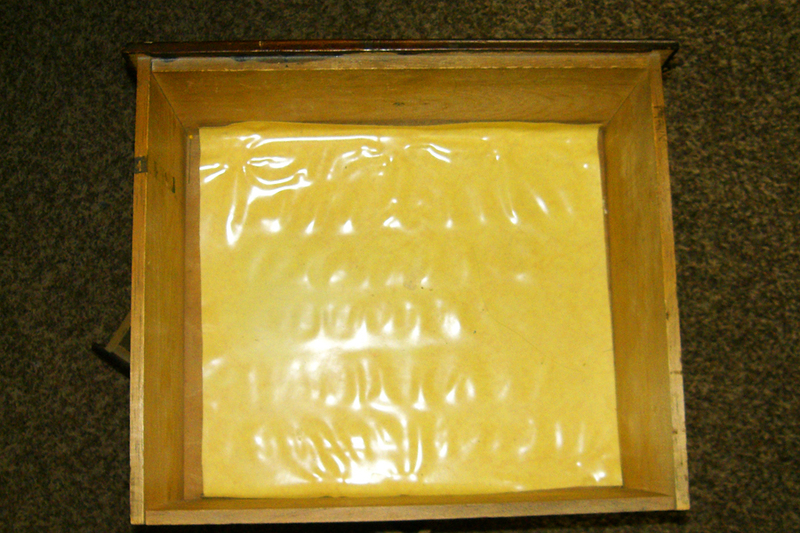 So, I sanded it down and painted it black and added some wrapping paper from Hobby Lobby (I geeked OUT when I found out we were getting one nearby--I nearly passed out in the car when David pointed it out to me) with mod podge for drawer liners. 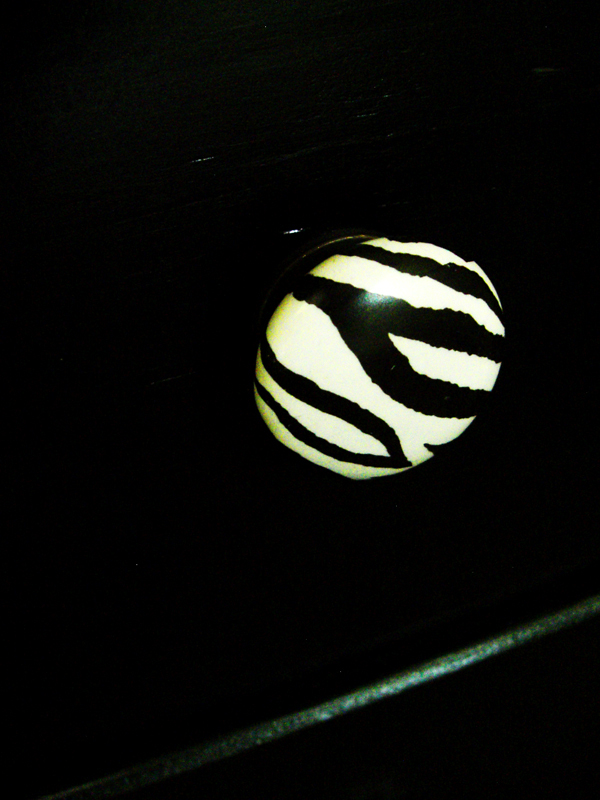 Then I added zebra print drawer pulls, also from Hobby Lobby. My goal is to have a touch of zebra print, a mirror and a clock in each room of the house, so here's the zebra print for the master bedroom. Ahhhhh, much better than the before, even if the pictures are not the best and my wires are out of control. I'm going to work on that. . . 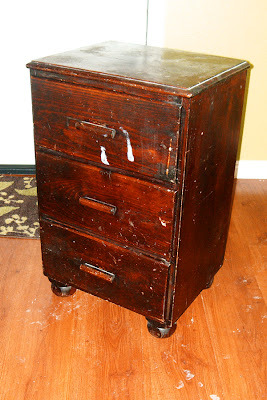 This is one of the reasons why I wish I had more space than there is in my cozy apartment--I can't so much do things like refinishing furniture. But this is adorable, and I particularly like how you used wrapping paper for drawer liners. Wrapping paper is much more versatile than it is marketed to be. 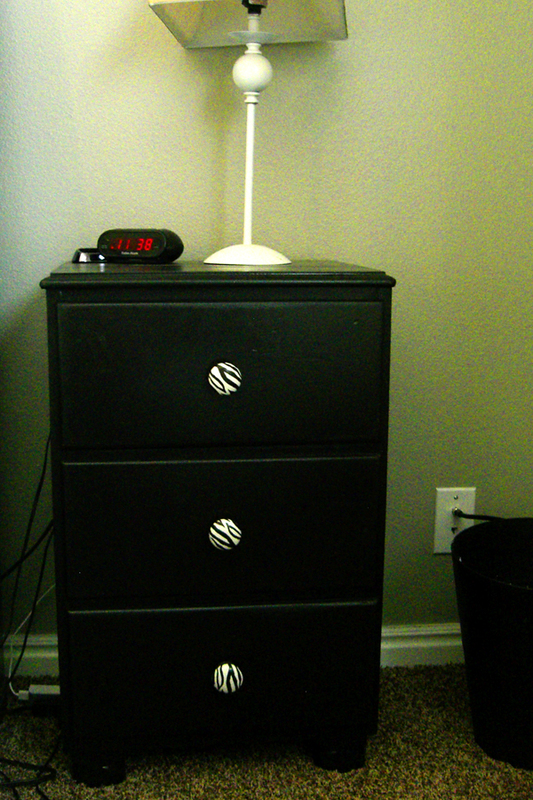 Great job on the run down bedside table. Love to repurpose stuff!! 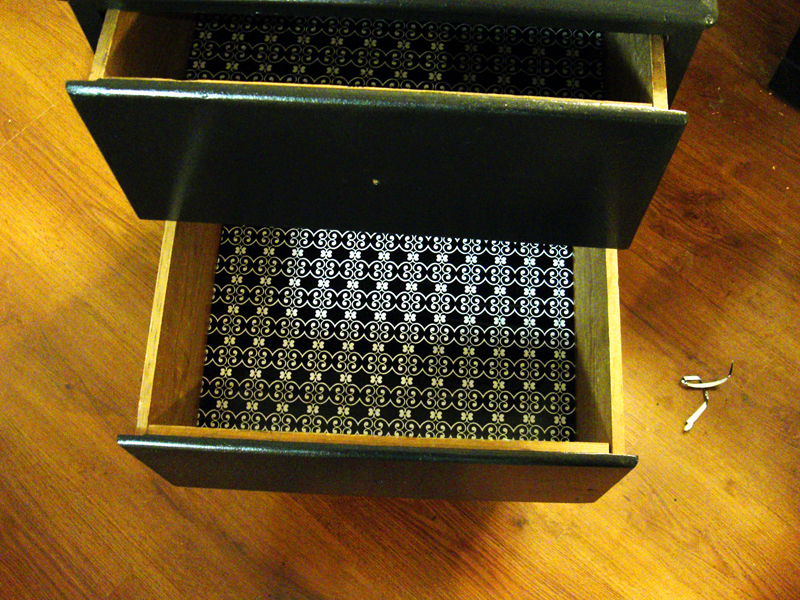 the drawer liners are fab! This looks great! Good job! 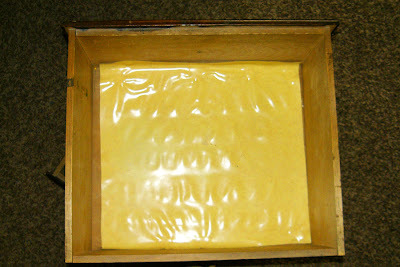 It's always the sanding that gets me - I want to just start slapping on paint, but this project shows why it is a good thing to wield the sandpaper. I awarded you with A Most Sylish Blogger Award...please feel free to stop by and see the post! PS, you are sooo lucky to be getting a HL near by!I dont have one, and the nearest michaels is 40 min away! :( *pout* all ive got here in this small town is a walmart! I like walmart.. but i mean it doesnt always have what I need! Ummm all I can say is WOW! Because that before pic was rough! :) Great job on the final~!